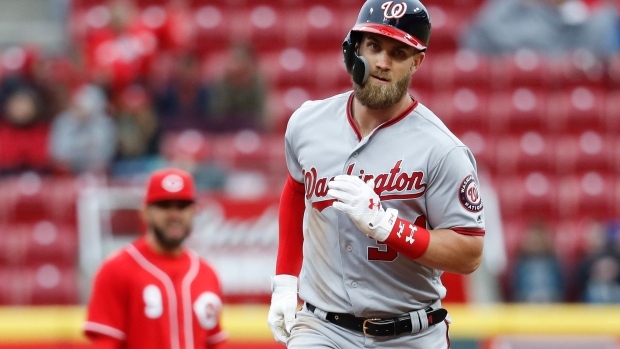 NEW YORK — Even with huge new contracts for Bryce Harper, Manny Machado and Nolan Arenado, Major League Baseball's average salary is on track to drop on opening day for an unprecedented second straight season, according to projections by The Associated Press. Last season's opening-day drop was only the second since the end of the 1994-95 strike, according to AP calculations, after a 2.7 per cent decrease in 2004. The union determined its final average as $4,095,686, down $1,436 from 2017, while MLB's figure was $4,007,987, up from $3,955,920 in 2017. The union includes option buyouts in its average calculation while MLB does not. The players' association is angry over the marketplace and is embarking with management on an unprecedented early start to labour negotiations that could lead to major economic changes. Sale, the left-handed ace who helped Boston win its fourth title in 15 seasons, has been with the Red Sox for two seasons following his trade from the Chicago White Sox. A key for Sale was staying with a team that holds spring training in Fort Myers, Florida, where he lives in the off-season. Already guaranteed $15 million in the final year of his previous contract, he agreed to a new contract for an additional $145 million from 2020-24.